The final goal of the UHPC staircase is to realize a unique staircase with unprecedented slimness. This blog enables you to keep yourself informed of the progress concerning the ultra-slim staircase. 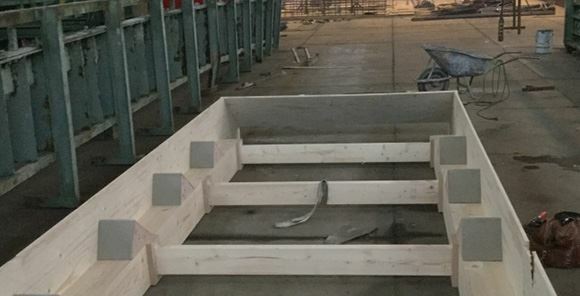 This blog is about the production and installation of the staircase. 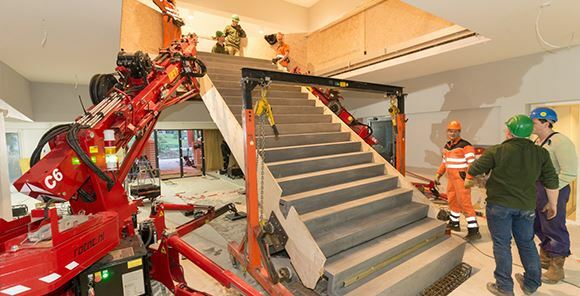 In order to be able to transport the staircase, the concrete staircase was placed on an auxiliary structure. This auxiliary structure is a tailor-made structure of wood and steel. The picture below shows a clear view of this auxiliary structure. In this picture the steel parts of the structure are still missing. At the factory the staircase was loaded onto a truck and subsequently transported to Velp. There it was temporarily placed in front of the entrance of ABT headquarters. The following day the installation process was started. Preparations were made prior to the unloading of the staircase. A number of steel sheets were placed, and the route along which the staircase had to be moved was cleaned and made free. After that the staircase was slightly lifted by means of a truck crane. Subsequently industrial wheels were placed under the auxiliary structure. Then, with combined efforts, lots of perspiration and muscle power, the staircase was pushed towards the void. As soon as the staircase was in place, the hoisting process was started. Getting the cranes on the right spot in the first place was a time-consuming job, which required a lot of turning this way and that. The lifting capacity depends on the distance between the crane and its load. Furthermore the crane needs to be placed in such a way that the jib always has sufficient swivelling space. When the staircase had been put in place, an attempt was made to lift it. During the first lifting attempt the cranes crunched and creaked. The crane operators did not look happy. Later it appeared that the load could not be lifted because of the fact that its weight was too heavy in relation to the hoisting distance. This was a setback, and the enthusiasm at that moment was miles away. After everyone had stopped scowling, consultations took place and finally a solution was found. A frame was built which lifted the front of the staircase. The rear side was to be lifted by means of the two cranes. A little later than initially planned the staircase was hoisted in place. Then it was installed, accurate to a millimetre, with the help of all kinds of technical devices. The frame was lowered, and in the middle props were placed. The centre props were screwed tighter until the right camber was reached. As a result of this the stair case shows minimal hair cracks above the props. The next day the bottom side of the staircase was anchored to the floor by means of concrete. After three days of curing the props will be removed. Subsequently the staircase will undergo a decreeping process*. Then the glass balustrades will be mounted and connected to the staircase. Would you like to see a sneak preview of the final version? Click here. *Process in which the staircase will be prestressed and monitored under controlled conditions.